46 Responses for "Pretty Pink Pastry"
Oh Yum! These cards look delicious! Today’s my b-day… so maybe I’ll actually get to eat some today too! My favorite would have to be….. hmm? You know… I’m not really sure! I’m thinking something rich like Chocolate Lava cake sounds pretty darn good! I’m not sure which of your cake cards I love more! They are both gorgeous! I love both of the cards! So pretty!!! Awesome job Lauren! Beyond gorgeous! These are stunning!!! Those cards look jummy! I actually have two favorite cakes. One is a Bailleys cream cake and the other one is a chocolate truffle mouse! Amazing creations Lauren. Can you just donat a few of your creative brain cells to me pretty please? I just want a couple!! Your family is in my prayers. These cards are both fabulous! I love that Eat Cake set, too. My favorite cake is lemon–with lemon filling and whipped cream icing! Boy, you just ROCK, my friend! LOVE these cards, especially the white card. 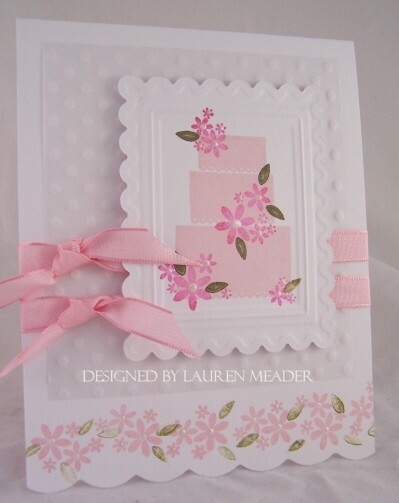 Love how you used the Spellbinders and the polka dot embossing. I will definitely be getting that folder when it comes out! Girl you are rockin’ those clear stamp sets! These cards are stunning! Seriously – so creative and fun. These cards are gorgeous!! 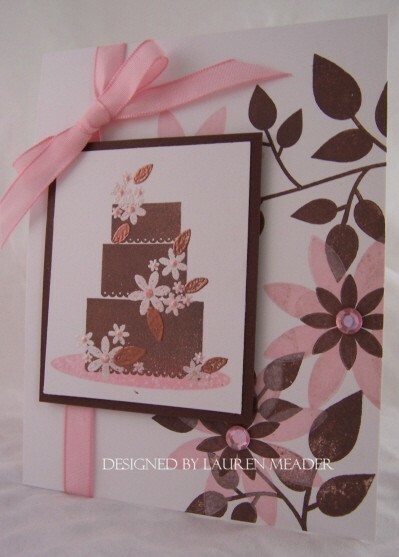 What was your process to emboss the cake panel of the first card? My favorite wedding cake is purely traditional–white with white frosting. You can’t beat a classic!! FABULOUS cards! You’ve really outdone yourself! Beautiful cards Lauren. On the white card could you explain how you did the nestabilities. It looks like you used 2 of them but I’m not sure. Any cake that I can have at a particular time is my favorite. These cards are just the motivation I need to start creating again. Thank you for sharing. my favourite cake has to be carrot cake – i went to florida (im in the uk) years ago and ordered a carrot cake and i could not believe the size of the darn thing! although actually whilst in america i fell in love with Key Lime Pie – but they dont do it over here, I’ve looked believe me. Wow! Both of these cards are amazing! That first one is just so soft and pretty, it has me sighing. The second looks absolutely delicious with the chocolate colouring! My favorite cake is confetti angel food cake. It’s fun to decorate and you don’t have to feel quite so guilty if you have a big piece. Wow… both cards are great – but the top card is breathtaking! It’s how I *wish* my wedding cake would’ve looked. Unfortunately, all my flowers fell off the top! 🙂 Thanks for sharing! Gorgeous cards, and I SO haven’t given in to buying this set yet stillt rying to be good, but it gets more and more difficult thanks to you missy! Congrats on your nominations, it’s a lot of fun to try and figure out who nominated you! Oh – and my favorite cake?? well – If I’m making my own, it’s yellow cake with chocolate frosting…totally plain and simple…if it’s from a bakery? Napoleon all the way…those flaky layers, that sickeningly sweet layer of icing on the top…mmmmmm. Love it. Gorgeous, Lauren! You’ve pushed me over the edge on this set (enabler)! OK girls I will do you one better-Ill post PHOTOS! Very cute card. Jacques Pastery is right down the street from me. How neat. Keepig you all in my prayers. Hi Lauren! Adorable cake cards! Love ’em! So funny…..I’d have to agree with Tracey. There’s nothing like my mom’s plain yellow cake with chocolate frosting!! LOL! But…..I also love rich chocolate cakes! Gorgeous cards, Lauren. Cake – I love Apple BArnyard Cake. It’s a spicy pound cake with chunks of apple and nuts and it’s got gooey brown sugar glaze on top. I also love plain old white cake with white frosting. Oh and mud cake and coconut. ALright, you know now. I just like cake. Oh Lauren those are stunning!!! I said ahhhhhh as soon as I opened your blog!! stunning cards Lauren-and now Im hungry!LOL! i can’t stop using the nestabilities either!!! i made a scalloped card today…my first, but not my last!!! I have my eyes on the new embossing folders also, I WANT that polka dots one and also the paisley one!!!! Two wonderfully done cards. I’m a bit more partial to the white one and can’t wait for ATS to get the polka dot template in either!! However, the second card is amazing as well. As for cake, our family has had a wonderful cake that we call the ‘birthday cake” because so many of us request it on our birthdays. Only 5 ingredients. Cake layers is made with ground almonds, eggs, and a bit bkg pwd I think. Bake on a cookie sheet and then cut into 4 sections. Alternate a layer of cake and one made of bakers chocolate mixed with butter and a bit of milk and you have an amazing cake. Now you’ve got my mouth watering! Problem is we’ll have to wait till January for my birthday to enjoy it again. These are great! I love them both and their so different, it’s great when a set is versatile! My favorite cake is yellow cake with raspberry filling 7 minute frosting and coconut pressed into it. The 7 minute frosting has almost a marshmallow creme flavor and texture, really sticky, ooey and gooey! YUM! My wedding cake had different cakes for each layer, the 1st layer was yellow with raspberry filling, the 2nd layer was chocolate with whipped cream, the 3rd was carrot cake and then the top “take home” layer for us was white with whipped cream and strawberry puree. Then it was covered in white fondant and a simple swiss dot formation and red roses. I LOVED having all the different flavors and tasting them all, I had nibbles from my friends who had different slices! Oh, and I’m all over those nestabilities when Papertrey gets them in stock! I want the rectangle and oval complete sets. I took the plunge and ordered a cuttlebug from ATS just for that! Of course now I’m going to have to get some embossing folders! love the cards!!! as usual! and congrats!!! These cards are absolutely yummyyyyy!!! My favorite cake – has to be chocolate and if it has caramel in or on it, even better! I’m not a big frosting fan so it really doesn’t matter what the frosting is. I’m gonna scrape it off. I hope you get paid for your work. It is priceless! Your cards are beautiful! my favorite cake ” RED CAKE” my mom would make it for my birthday every year, now I just make it about once a year, thanks for reminding me, I need to make one of these, soon! I love your new cards but have to ask how the heck did you get that beautiful dry embossed look on the first card. I love it. Oh…and I’m a white cake/whipped frosting girl. These are gorgeous! I’ll say a prayer for your DH. Okay, now I *need* this set too! GORGEOUS job on both cards! Loved your wedding cake too. So pretty! Hey are you still doing cakes? You were so good at it too. Still praying for good news for Jason. BTW, I posted the Key-Lime Pie recipe on my blog for Deanne. These cards are just awesome Lauren! They look so real and make me hungry! Thanks a lot!!! LOL!!! OH MY! These two creations are just lovely… they should be framed and hung on a wall!! Absolutely stunning Lauren! These are both gorgeous! Love your scalloped rectangle embossing idea! These are so gorgeous!! Please please when you have time post them to your scs gallery. I want to save them in my favs so i can enjoy them every time i look in there. You’ve created some gorgeous artwork and i love looking at it. Thanks!